Madame Alexander introduced a new version of the Tin Man as part of the Wizard of Oz 2012 Collection. He is an 8 inch boy with blue eyes and a silver painted face. He wears a silver satin jumpsuit trimmed with silver nail head buttons on the center front, the edge of the hood and down the leg.Silver stitching along the edges of the elbow and knee pads add detail to his suit. 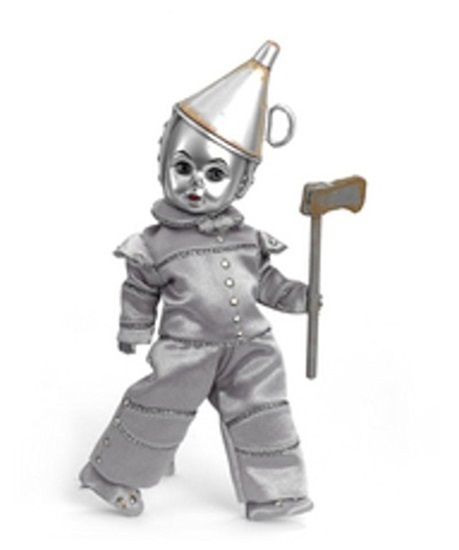 The Tin Man is wearing silver shoes that match his jumpsuit; as well as a ceramic funnel hat painted silver with rust edging. As an added touch, he carries a rusting ax.